Android users that love to customize their devices should know that they can easily sync the Contacts stored in their phone with the device’s designated Gmail account. This trick helps you keep your phone, Google+ contacts and all the other profiles synced with your Gmail Account, the one you’re using the Google Play Store and with all the other Google services. This feature is great and you can easily perform all the changes and syncing in several steps. Syncing contacts with Gmail account comes in handy when you want to root/ update the firmware of your phone. As you know, while rooting or updating firmware you’re risking to damage data files, SMS text messages and contacts that could get corrupted or lost. 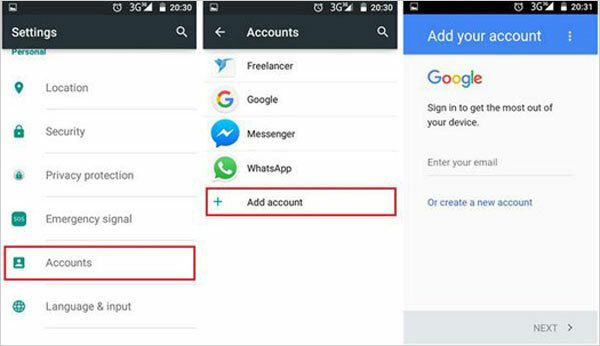 That’s the reason I’ve created this article, to help you sync the stored Contacts in your Android phone with your Gmail account successfully. Before moving to the blog guide you need to make sure that your Contacts are linked with the Gmail Account. Select ‘Merge with Google’ and then confirm the action. In case you have more than one Gmail accounts then select the one you wish to use as default to host your contacts. Step 1. Unlock your Android phone and enter the “Settings” on the device. Step 2. Choose “Accounts & Sync” under the “Settings” section and elect the “Add account” option. Step 3. Tap “Google” from the list and click the “Next” button to go to the next interface. Step 4. Hit the “Sign in” button if you already have a Google account and then enter your username and password. If not, you need to create a Google account at first. Step 5. After entering your Google account, you can see there are many file types under the “Sync” setting. Just mark the “Contacts” option to activate the contact synchronization. Here, you can also tick off other options to sync the files.